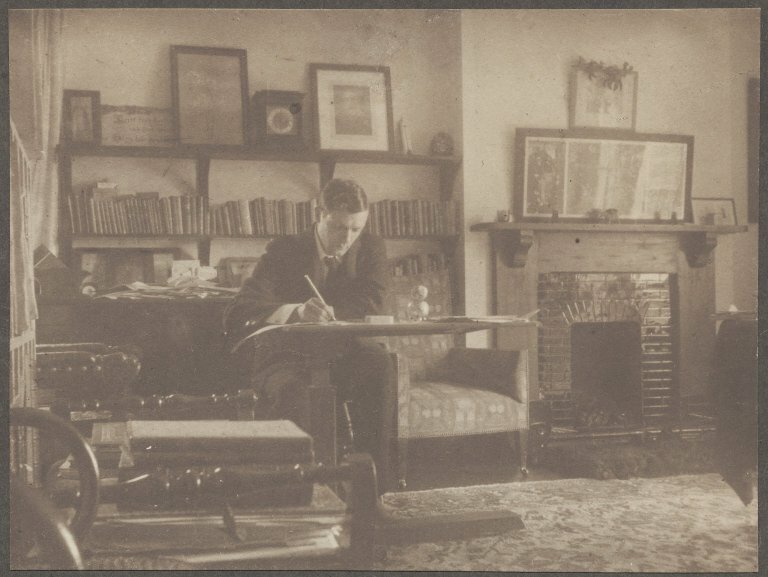 For the past few years, we have had one of our volunteers, Fiona Donaldson, working with Deputy University Archivist, Grant Buttars, to develop a usable catalogue to our Tovey Collection, one of our larger collections of personal papers we hold. We are now able to offer an unfinished but usable ‘pre-release’ to allow researchers and other users get a better handle on what’s in the collection while work continues. 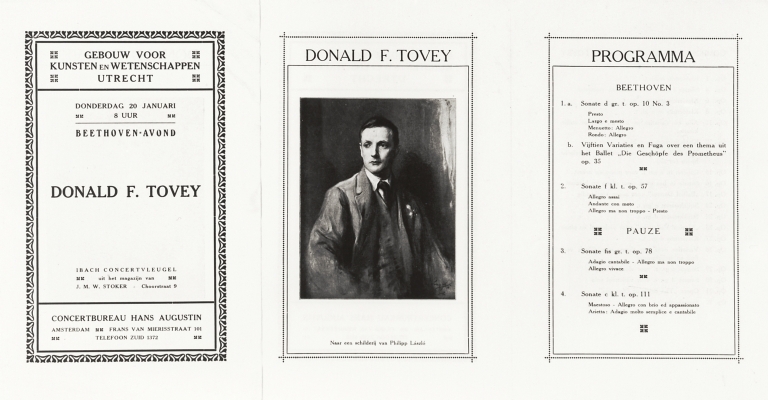 Donald Francis Tovey was born at Eton on 17 July 1875. His father was an Assistant Master at Eton College. He was educated privately by the music and general teacher Miss Sophie Weisse (1851-1945) and later on studied under Sir Walter Parratt (1841-1924) and Sir C. H. Parry (1848-1918). Tovey then won a music scholarship to Balliol College, Oxford, graduating with a BA, Classical honours, in 1898. As a pianist, a series of chamber music concerts followed in London, Berlin and Vienna where he played with Halle, Joachim, Hausmann, Casals, and other artists. He also composed. In 1914 he was appointed to the Reid Chair of Music at Edinburgh University in succession to Professor Niecks (1845-1924). As Professor he broadened the music curriculum by instituting classes in musical interpretation, orchestration, history and analysis, thorough-bass, score reading, and advanced counter-point and composition. Tovey also established and conducted the Reid Orchestra and organised an annual series of concerts. His musical compositions were in many forms including chamber music, symphony, grand opera and concerto, and probably the most famous was his opera The bride of Dionysus produced in Edinburgh in 1929. His literary publications include the six volumes of Essays in musical analysis (1935-1939), and A musician talks (1941). Tovey was knighted in 1935. He died on 10 July 1940. The largest part of the collection is the papers of Tovey himself. 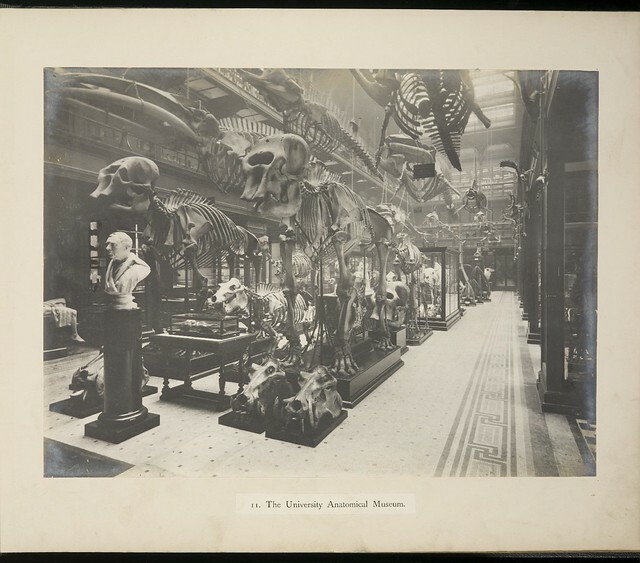 Following his death, the collection appears to have remained in what became the Tovey Memorial Rooms at 18 Buccleuch Place, from where they were taken to Alison House sometime after the Faculty of Music took up occupancy there in 1964. During its time in those locations it appears to have been augmented, with the addition of particularly correspondence and notes of Tovey’s biographer, Mary Gardner Grierson (1896-1964) and post-Tovey records relating to the Reid Orchestra and Choir. Tovey’s teacher and mentor, Sophie Weisse (1851-1945), is also well-represented. Perhaps the clear boundaries between what simply began as adjacently shelved material became indistinguishable; by the time the collection was transferred here from the Reid Music Library in 2001, it was all seen as one overall collection and it has not proved possible to fully disentangle it. We have concentrated on sorting out obvious disorder but with a light-touch approach, creating a meaningful arrangement and, as far as possible identifying what is clearly Tovey’s papers from what is not. Basic repackaging has been undertaken where needed. The catalogue benefits from earlier cataloguing work that was undertaken when the collection was still in the Reid Music Library. It focussed on the correspondence (the largest single series within the collection) and the database created than has been converted and imported into the new catalogue. Our volunteer Fiona is currently a PhD student but also a former administrator from within the former Faculty of Music. Drawing on this and other related collections here, she has been creating a database to Reid Orchestras as part of her PhD research. This entry was posted in Collections, Projects on 09/09/2015 by Grant Buttars.